So, you wanna host your own blog? A domain name is an identification label to define a realm of administrative autonomy, authority, or control in the Internet, based on the Domain Name System (DNS). To make it simple, hosting is a place where you store your site/blog files. These file then made public by the hosting provider using an IP address (which has forms as sequence of numbers). Because of human remember names better than numbers, domain is used to naming the address numbers into words. So if someone entered your domain name into their browser, it will be redirected into DNS who will find the IP address of your hosting. Then the blog files will be transfered from hosting server to the browser. Okay, that’s the basic theory. Should I buy a hosting? Back to the questions, should we buy a hosting? It depends on what are you needed. If you’re just starting to blog, it’s more likely that your web traffic will be low for the beginning. There are two options for this need. First, you can buy a low cost hosting. With the dawn of the blogosphere, hosting providers most likely gave some special packages for blog hosting. The packages usually started from the low-traffic for blogger noobs to heavy-traffic for professional bloggers. You can start by buying the low packages first. Then, if you’re succed in increasing your blog traffic, you can always upgrade to the bigger packages. Second, you can start by registering a free hosting service. We must be grateful. Some nice people just wanna give away a web hosting service for free. Some of them need you to place ads on your site or posting on their forum, but some of them just give it away. The features given by this free hosting service sometimes better than the low-cost hosting. But as the consequences, they didn’t give official supports. No need to worry, they also provided an active forum to solve all of your problems. After this, you might be thinking, why should I paid for a hosting if I can get better features on free hosting? Well, there are some factors that you need to take for considerations. Usually paid hosting is hosted in your own country, although some of hosting providers also give an option to host your web abroad. If you hosted in your own country, the loading time is faster for local visitors. It means, if you’re hosting your blog in Indonesia for example, visitors from Indonesia will load your page faster than if you hosted your blog out of the country. The second is supports. We’ll get better support from paid hosting. Any problems will be resolved quickly and no need to worry about your site can’t be accessed because accidently violating terms of service. As for free hosting, the supports are usually can be found on the forum and hey, you can always Google the answers. 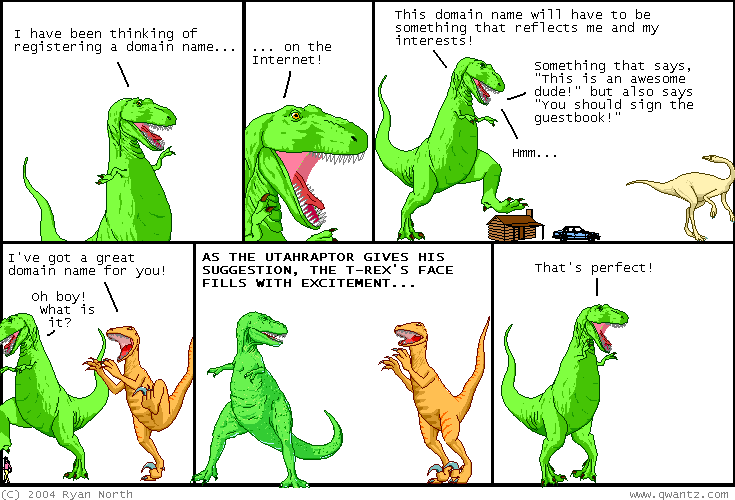 Just like as the T-Rex said, domain name can reflects to you and your interest. It’s like an identity for your blog. Free blogging hosting like WordPress.com or Blogspot give you your own domain name as their subdomain. That’s why the domain name has their domain name in the end. For example arifn.wordpress.com means that arifn is my domain name as their subdomain in wordpress.com. Feeling curious about subdomain? read it at Wikipedia. There is no problem about this given domain name. Except that, it’s just to long. Sometimes you’ll need shorter url to make it easy to remember. So, if you’re okay with this name, you can end your read. But if you feel curious, don’t hesitate to keep on reading. Although hosting reseller sometimes give hosting+domain name packages, we can always buy just a domain name. With this domain name, we can change our blog hosted in WordPress.com and Blogspot address. So we don’t need to buy a hosting, but just buy the domain and rename our blog hosted there. To do this we need to buy some credits from WordPress.com, and for Blogspot we can do this for free. After that, you don’t need to worry about hosting or version updating of our blogs. Yes. There are two alternatives that you can do about domain. Both of them are free and we just need some little efforts to do it. First, using free url redirection. This is the main concept, url redirection redirects an address of our choice to another address of our choice too. We just need to register an url redirection service, pick an address, then set it to redirect to the address of our own blog. For example, I got blog in WordPress with the address of arifn.wordpress.com. Then I register an url, like arifn.iscool.net and set this address to redirect to arifn.wordpress.com. The benefit of using this alternative is you can pick your url that most likely easier to remember. The cons, sometimes you must sincere that your traffic stats is donated to the url redirection service provider. Second, we can buy or get free domain name and mapping it to our hosting name servers. There are some free domain name providers that you can use. Then we just need to map it to our hosting. The hosting service provider usually have their own name server to use on your domain name management. After we set the name server, we can add an add-on domain in the hosting control panel. As this setup is different from host to host, we can consult it with our hosting provider. This is the goodbye part. I hope this writing can help you. If you found any mistakes, don’t mind to correct me. Comments are always welcome and happy blogging! Selling products as an domain reseller is a great way to make money. For one thing, you get to earn money from the products without having to fulfill them yourself or deal with customer service issues. Nothing is better than that! The returns are usually higher than with Adsense, provided you’re able to find an offer that converts well with the people who visit your website. Here is some caution we all need to look out for!! The beautiful thing about a good domain name is that every domain name is unique and can be a sustainable competitive advantage even for the “little guy”. But beware, I do put a word of caution out into the community that there are a lot of registrars that when you type in the name to see if it is taken, they immediately register it for themselves (if you don’t). This is a disgusting practice. When I started blogging I never really thought of buying my own domain. I just wanted to write and blog all my ideas, aspirations, dreams and anything that are happening to me. First: cool Blog desing I like this and second, Thanks for the info I was enjoyed reading. bye.